This year I am getting into the Halloween and Fall season decorating more than I ever have before. Having a little person makes crafts and decorations so much more interesting! 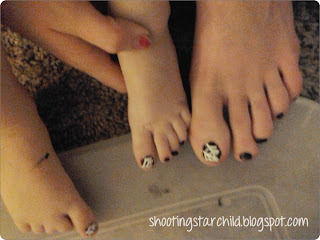 Aunt V has been helping 2Flowers get into the spirit of things this week by painting spiderwebs on her toes. 2Flowers likes the spiderwebs on her toes (she loves the Itsy Bitsy Spider), but not the spiderwebs at the Halloween store she visited with Daddy today. "I don't like spiderwebs," she said today, after a week of liking them. Kids are so funny at this age. Kaelyn does the same thing. One day she loves blueberries, and the next she's telling me, "I don't like those anymore." And then of course, she's right back to liking them again in no time at all.